Edison came to Louisville in 1866, at the young age of 19, to work as a telegraph key operator. 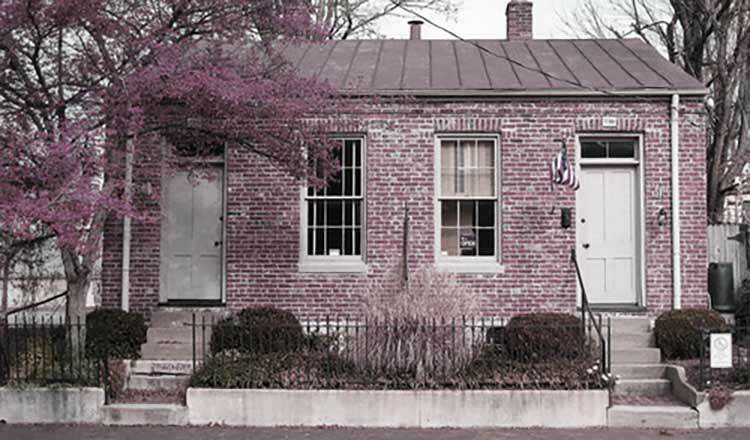 With his skill at receiving telegraph messages, Thomas Edison had little difficulty landing a job with the Western Union located on Second and West Main Street -- about eight blocks from this home. Apparently, Louisville was also experiencing a shortage of telegraph operators at the time. In August 1866, Edison and two fellow telegraphers left for New Orleans where they planned to board a steamer bound for Brazil. When they arrived there they found the waterway shut down because of a recent riot. Edison decided to return to Louisville where he took up residence at East Washington Street in fall 1866. During Edison's years as a telegrapher he became fascinated with improving the telegraph. Most of his early inventions were either improvements of the telegraph or similar machines, such as a fire alarm telegraph. In October 1868, about year after he left Louisville, Edison was granted his first patent for an electric vote recorder intended for use in the U.S. Congress. He was issued more than 125 patents related to the telegraph during the following years. Throughout his career he continued to turn to his experiments with the telegraph as inspiration for his inventions. In 1879, Thomas Edison invented the incandescent light bulb. The electric light bulb wasn't Edison's favorite invention, but certainly his most famous. Our light bulb collection consists of many varied types of early light bulbs and you will notice many of them have pointed tip ends. Gases were removed through the top of the bulb. Once a vaccuum was created the bulb was sealed at the tip. This cottage was built around 1850 and, as a shot-gun duplex, originally had a solid wall running down the center of the structure. Only the most basic accommodations would have been afforded. During his stay in Louisville, it is said that he befriended newspaper editor, George Prentice, of the Louisville Journal. In addition to trying to teach himself Spanish, he developed a new style of penmanship. His intention was to write characters that were blunt and vertical, suppressing all curls and fancy loops -- a simple manuscript-print that was more legible and would quicken his speed as a telegraph operator. Some of the interesting artifacts found at Louisville's Thomas Edison House include both cylinder and disc phonographs, as well as Edison Business Phonographs. An Edison Kinetoscope, the first home motion picture projector, is also on display in the museum.